Jess Bradley is an excellent artist and illustrator who has dabbled in a variety of weird and wonderful projects. Her art is undeniably cute, and also appeals to film and video game fans. It is clear that Jess Bradley shares this blogger's passion for video games, as she regularly injects her style into classic characters, such as Link from The Legend of Zelda. Jess kindly agreed to an brief interview for 8-BIT Girl which focused on the video game side of her art, and here are her answers! What video games inspired you to draw game fan art? My favourite games always inspire me to draw fan art; I play them so much and get hung-up on a lot of the characters, I like to try and put my own spin on them! Bomberman was the first proper game fan art I did; I made an acrylic canvas painting when I first started getting back into it a few years ago. What video game fan art are you most proud of and why? I think my Katamari/Bomberman picture is my favourite pic; the silly idea I had worked and I got to draw two of my favourite game characters! This always sells well at cons as a print which makes me happy that other people like the games as much as I do! You've done countless conventions, and have a great store up online. What has been your most successful video game related product? 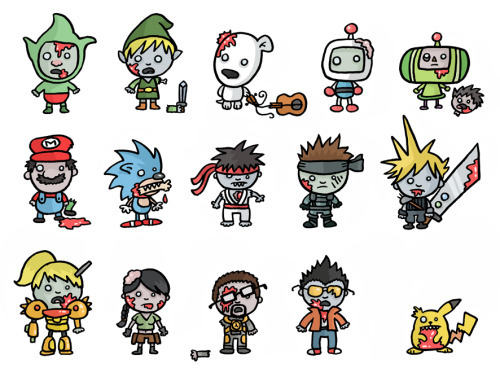 I'd say the video game zombies print; it gets a great laugh when seen by people at cons, usually followed by the statement "I have GOT to have that!" I'm always aware that the characters I draw aren't mine when it comes to fan art but I like to think people want them because I've drawn them in my own style too. You've been a pretty busy woman lately! What's next for Jess Bradley? Ha ha ha! Yeah, there always seems to be something going on! I'm currently working on my own kid's book pitch which I'm excited about but terrified to send to publishers so we'll see how that goes! I've got a few comic strips appearing in small press anthologies this year and I'll be pimping myself at a lot of cons. We'll see what else pops up in the meantime!